Have you tried music therapy for stroke recovery yet? You should — because it’s clinically proven to boost your progress. There are 5 major ways that you can benefit from adding music to your rehabilitation from stroke. We will discuss these 5 benefits (and the hard science behind it!) and then share different ways to add music to your regimen. Let’s start with the smaller benefits and work up to the massive gains you might see. Get ready to give your brain a better workout! One study found that music therapy helps improve cognitive function and attention span after stroke. This means that music therapy can help you regain your mental agility and improve your focus. Have 20 minute music-listening sessions where you just lie on your couch and listen to music. Make the music the only thing you focus on. Pay attention to the rhythm and lyrics, and let your brain get a little workout from the stimulation. Although it might not feel like a big deal, it’s actually doing wonders for your brain! One out of every 3 stroke survivors deals with post-stroke depression. This is a huge problem. Fortunately, music therapy has been proven to help improve mood and reduce feelings of depression after stroke. Indeed, music is emotionally healing. The next time you feel sad or depressed, try playing some upbeat tunes. Not only will this help stimulate and heal your brain, but it will also lift your mood! The more you stimulate the brain after stroke, the more the brain will heal – and music does just that. That’s a lot of stimulation! And that means more fuel for your recovery. In this study, music therapy was shown to significantly improve quality of life after stroke. Now, “quality of life” might seem vague, but it’s actually measurable using the Stroke Specific Quality of Life Scale. Make music part of your life! Play it often. Play music in the background when you’re making breakfast. Play it when you go for a walk. Play it all day, every day. 5. Music Therapy Boosts Movement Recovery! Music therapy has actually been proven to help boost motor recovery after stroke! Studies show that combining rhythmic music with rehabilitation produces better results. This study stated that music-supported therapy was accompanied by improved activation of the motor cortex – which is a fancy way of saying more movement improvement! Music therapy can be a game-changer for all stroke survivors trying to improve movement after stroke. There are many ways to combine music and rehabilitation. For example, our MusicGlove hand therapy system combines music therapy with rehab through a fun, therapeutic game. Now that you know about the healing power of music therapy, it’s no surprise that MusicGlove is clinically proven to work within 2 weeks. If you’re serious about improving hand movement after stroke, consider adding MusicGlove to your regimen. Overall, music therapy greatly boosts stroke recovery. It engages many different areas of the brain, improves cognitive function, and boosts movement recovery after stroke. 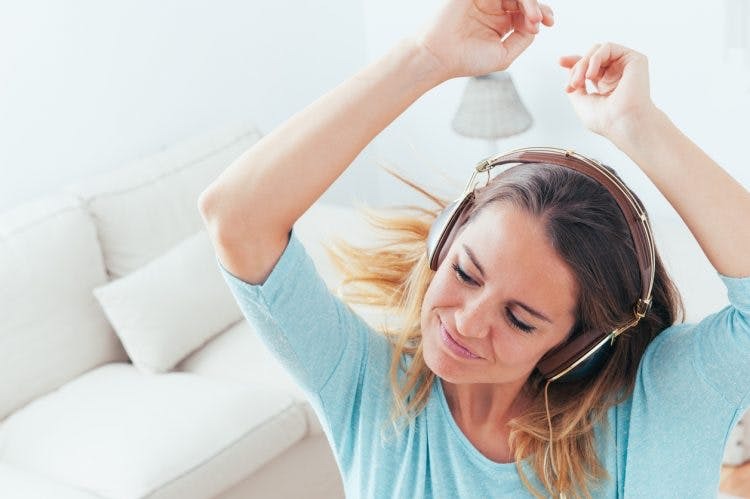 Some ways that you can incorporate music into your recovery are simply listening to music throughout your day and using music-based rehab devices like MusicGlove. How will you add music to your regimen?